I always think it’s odd when a person on my boat catches a fish and then goes all “icky” at the thought of actually touching it. Some of the time it’s because of the size of the fish. Grabbing a crappie or bluegill flopping on the dock is one thing, but grasping a salmon or trout almost three feet long is something else. Most of the time size doesn’t matter. Many people are just plain reluctant to grip the fish they’ve just caught whether it’s a panfish or the biggest fish in the lake. Some of it is unfamiliarity. It’s easy to figure out how best to hold a puppy or a cat. It’s not so easy to grasp just how best to grasp a fish. Granted, some fish have sharp pointy things on them such as teeth, spines on their fins or sharp stingers like catfish do. These can hurt. 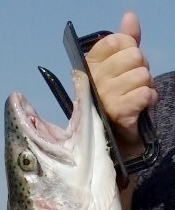 Trout and salmon do have teeth, but no spines or stingers. Mostly, I think, it’s the fact fish are generally wet and slimy. Is it a human trait to have a natural aversion to grasping things wet and slimy? I don’t know. If so it expresses itself (most often - not always) in women and youths. These days, I don’t even ask when a youngster or one of my female fishing guests catches a “photo-worthy” fish. 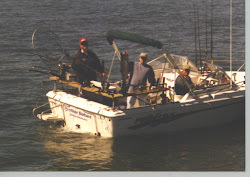 Instead of trying to coach or coax the fisher person to correctly grip their fish while the photographers on board get their “happy-snappies,” I just pull out my Fisherman’s Handy Hook. This fish has a date with the deck. Should have used the Handy Hook! Basically, it’s a tough plastic tool with an easy to grip handle on one side, a strong spike on the other and a plastic divider to ensure none of the “icky-gooey” stuff on the fish gets on the hands of the person holding the fish. Easy to use, all I have to do is slide the spike under the fish’s gill flap and out through the fish’s mouth. 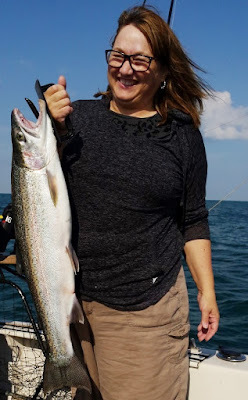 Now the happy angler has a fish with a handle on it and chances are I’m not going to have the clean the icky-slimy stuff of the floor of the boat after the fish has been dropped a few times. Check out www.thefishermanshandyhook.com for more details and purchasing information.